It is with a heavy heart after the tragic passing of Sid Waddell on Saturday, that I write with official (but slightly tardy) notification of the results of the sixth Bermuda Classic, which was held on Saturday 28th July at Old Alleynian FC rugby club on Dulwich Common. The winner was Tarquin 'Al Fresco' Hellier, who beat a gallant and gracious Claude 'Ze Frog' Rossi in the final to take home the highly coveted Bermudan Dart Fish trophy and - even more momentously - unify all three Lardy Darts titles in a single season, the first man to ever achieve such a feat! Congratulations to Al Fresco on a great game and a new Lardy Darts record - a fabulous performance! Congratulations must also go to Jono 'El 8 Bal' Seward, who hit only the second 180 in Lardy Darts history - a wonderful moment for Jono, and the highly appreciative Bermuda Classic crowd. Unfortunately, Jono was so blown away by his achievement (or maybe the Captain Morgan's that swiftly followed) that he was rendered incapable of finishing off the 121 remaining on the score board, letting Declan 'The Rage' McGill overtake him in a ridiculous 'tortoise and hare' fashion to take the leg about 50 darts later! 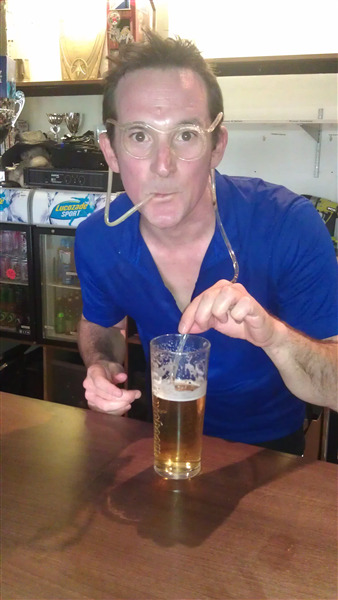 Closing congratulations go to the winner of 'The Jocky', our new award given to the most 'out of it' man on the day (The Jockey Award). Despite a very admirable late charge from Claude 'Ze Frog' Rossi, who in the last half hour of the competition had five shots of throat-ripping rum, one raw shallot and two raw cloves of garlic, sustained and purposeful drinking proved to be the key to victory. As such, it might come as little surprise that Declan 'The Rage' McGill was the eventual winner, with a late charge just before kebab time on the way home from the pub. Walking past the open door of a private property on Lordship Lane, from which emanated the sounds of a thumping house party, McGill immediately turned on his heel and marched straight in to the residence, uninvited and empty-handed, in a bid to make friends and spread the gospel of Lardy Darts. El 8 Bal and the Heatseeker, who had walked on ahead to go and order the kebabs, were largely unsurprised to be joined approximately four minutes later by McGill, who had failed in his bid to be embraced by civilised society and had been promptly ejected. Finally, a brief word on the life of Sidney Waddell, TV sports commentator and writer (born 10 August 1940; died 11 August 2012). When Lardy Darts began in 2001, the attendees of that first legendary tournament brimmed with enthusiasm, but struggled to capture in words the grace and majesty of our beloved sport. But in Sid Waddell, we found a hero capable of tear-jerking poetry and pant-wetting hilarity within the space of a single phrase, and his words have accompanied and enhanced our enjoyment of darts ever since. It is hard to pick out a favourite saying of his, but please do try to - a page of his quotes has been present on Tarqs' Lardy Darts website since its inception, and on Sunday with the news of Sid's final check-out, the site recorded its highest ever day of visitors – 5,428, with 7,350 page views of Sid's quotes! You can see it here: Sid Waddell quotes. There are also many moving and hilarious obituaries out there, most of which are well worth a read, but I think this is the most fitting tribute I have seen - a Sky Sports video made when he was still alive, with him trying to put into words the art of darts commentating: www.youtube.com/watch?v=6OvGM1EFFxA. RIP Sid.